As a member of the Iranian intellectual circle, the author of Introduction To The History of Political Thought in Iran and a former professor of philosophy at the University of Strasbourg, Tabatabai is perfectly qualified to judge The X Factor. What’s more, it’d mean he’d probably get loads of exposure for his debut single Girls Make My Heart (Go Binky Bonky Boo). Imagine it. Imagine Jedward and Louis Walsh all judging The X Factor together. Imagine how inane their combined criticism would be. Imagine what sort of terrible moron they’d pick to win. Imagine how long it’d be before all the blood in your body deliberately stopped coagulating as a desperate last-ditch effort to punish you for making it sit through such a relentless torrent of idiocy. It’d be brilliant. While Tulisa was chosen for X Factor because of her compassionate street smarts, you can guarantee that she wasn’t anybody’s first choice of N-Dubz judge. Not while Dappy is still alive. He’d be a marvel on X Factor – an angry, gibberish-shouting marvel in a stupid hat. Maybe next year, Dappy. Maybe next year. Similarly, Howard Donald must have made the shortlist. Not the 2011 Howard Donald, though. The 1995 model, who had dreadlocks and a pierced eyebrow. Who wore mesh vests and got his bum out a lot. Who stood at the back and sporadically made sad Chewbacca noises. 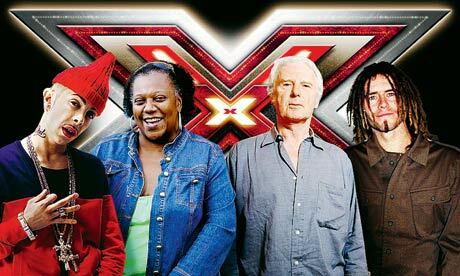 That’s who should be judging X Factor, not Gary flipping Barlow. Not necessarily because his haughty, out-of-touch, classist meanderings would be hilariously at odds with Louis Walsh’s dim-bulb squawking. More because, if faced with another Wagner, only someone like Sewell could eloquently align the performances with other great works of art. That or he’d attack him with a hammer. It’d be fun to see Brian Sewell vault over a table and attack someone with a hammer. AKA Pauline Pearce, the woman who was filmed screaming at looters a couple of weeks ago. She’d be a fantastic X Factor judge. Some trembling poppet would wobble on, squeak out a duff version of The Greatest Love Of All and get hammered with “Get REAL!” In fact, Pauline should stay at home. Just the video of her would do. It’d be better than a member of N-Dubz, for sure.